A non-stop whirl of feverpitched acrobatics, cycling and hula-hoops to infuse your Thursday thinking. Let Stumble danceCircus play for 90 seconds in the Space. 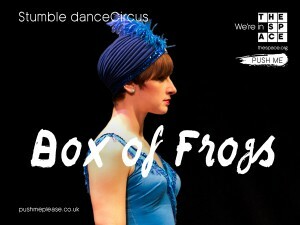 Stumble danceCircus presents Box of Frogs – a circus show with a difference. Five acrobats and two musicians play with the audience’s expectations of mental ill-health and performance, against a backdrop of filmic illusions. This entry was posted in General, Mish Weaver/Stumble/Box of Frogs, The Space. Bookmark the permalink.